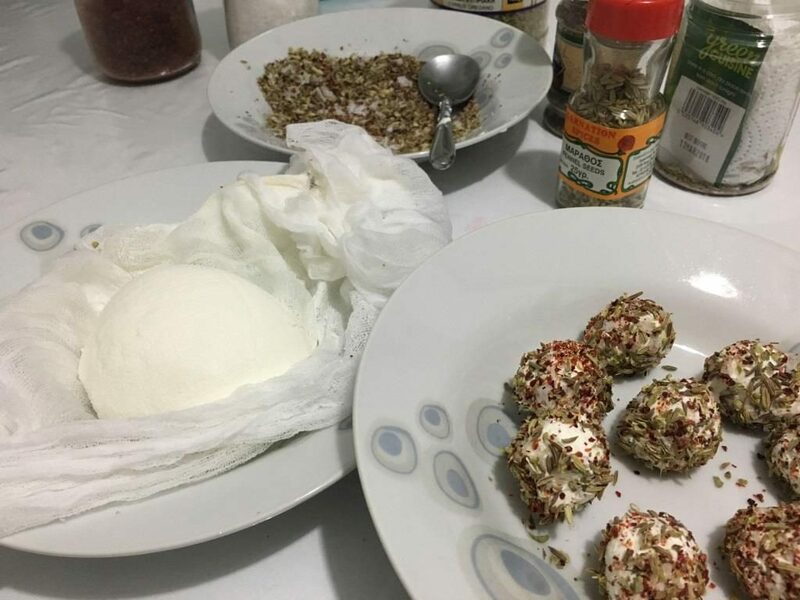 Here is a simple little recipe for labne with herbs that is a lovely concoction of flavours and is so handy for bringing a few new interesting tastes to the table. 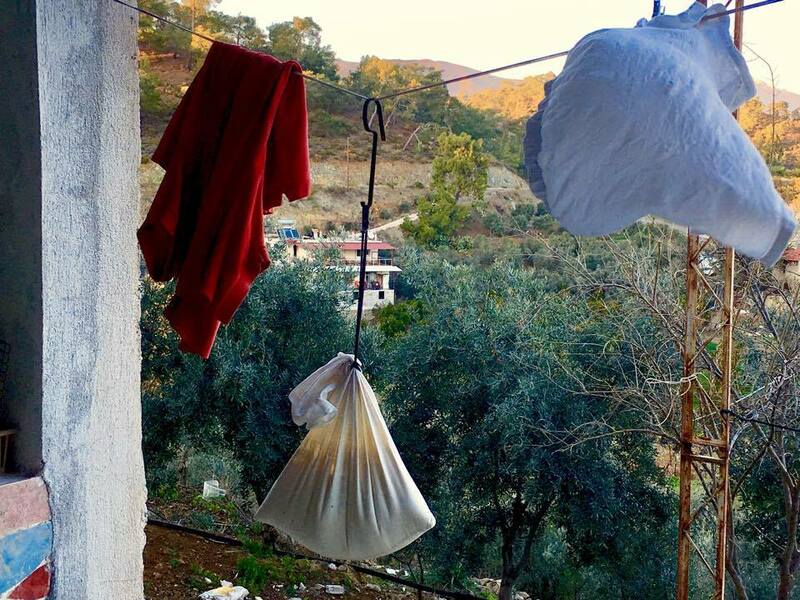 Making yogurt at home is common practice for villagers and it’s common to see yogurt bags hanging from washing lines, dripping their watery substances (whey). 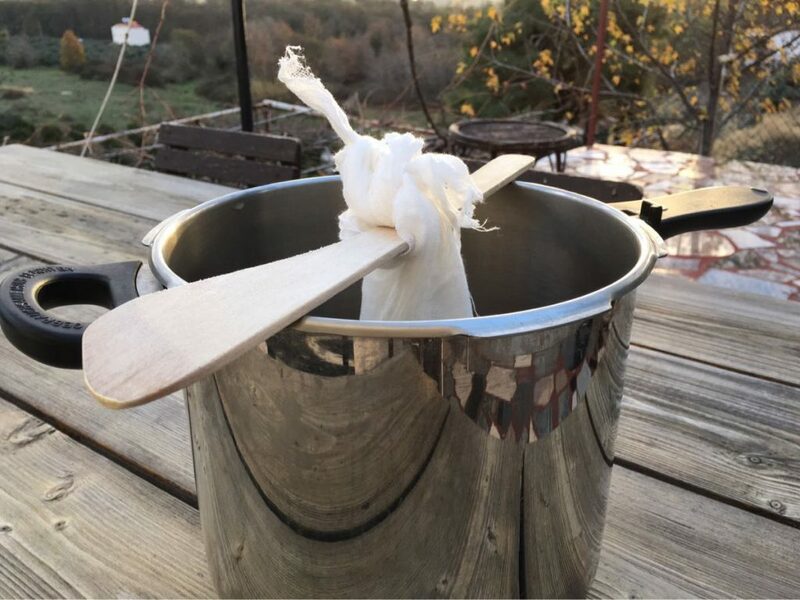 The yogurt is hung in order for it to strain as much as possible. Strained yogurt, closer to the Greek variety is called suzme yogurt. One step further and it is dried to the point of being able to spread it on bread with a knife. It is then called labne. It’s fine to use store-bought yogurt and just go from there to create your own labne with herbs. It’s a very quick process and has a very tasty result. For this recipe, it is important to use full fat yogurt. 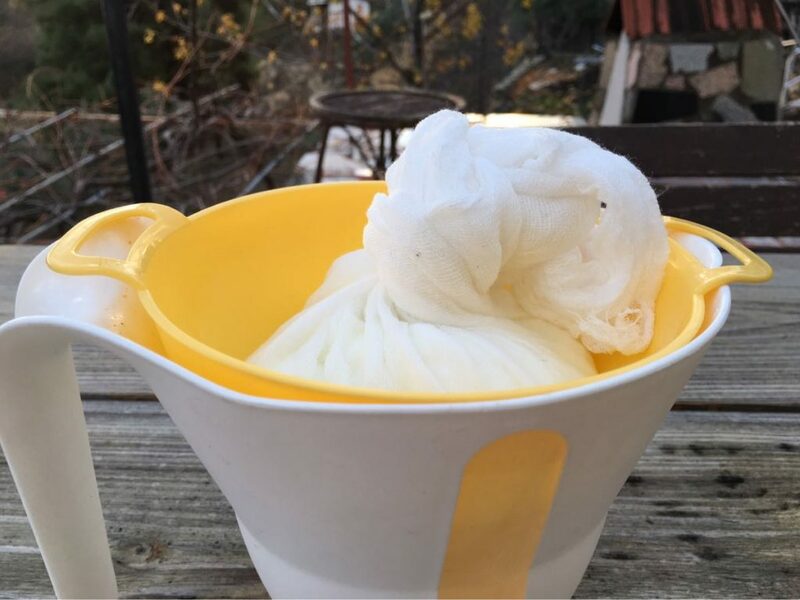 At home I find it easier to sit the yogurt in a strainer, lined with cheesecloth. 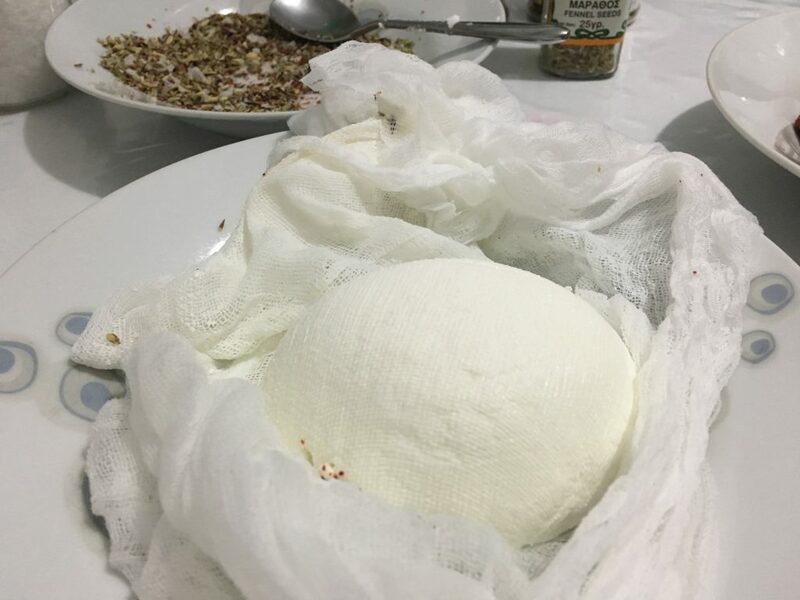 However if I want an even drier labne than usual, for shaping purposes (such as this recipe), then I form a ball with the cheesecloth. The ball can be hung from a cupboard door or a tap or if you prefer, you can tie it to a long handled spoon which is balanced on top of a deep pot. Labne can be spread on bread, toast or crackers and can be eaten at any time of the day. The flavours are clean and strong but not overpowering. The amount of salt is up to you. I like to use Maldon or kosher salt with this mix, which is actually less salty and has that flaky consistency, but table salt will do, just don’t use as much. If wanting to eat this labne for breakfast, you may prefer to leave the garlic out of the jar or have two smaller jars, one with and one without. You can choose whichever herbs you wish to add but I thoroughly recommend trying this spice combo. If you can’t easily get any caraway seeds, just leave them out rather than substituting anything else. Place a sieve over a jug so it sits snugly and line the sieve with cheesecloth. Leave until quite dry. This can take up to 2 days depending on the weather. Mix all the herbs and spices together, excl the garlic, in a wide bowl. Roll the cheese balls in the spice mix and place in a wide necked jar. Drop the garlic cloves in the jar. Pour olive oil over the cheese balls, making sure they are all submerged. These can be eaten immediately however the flavour will mature with time. As long as you keep the labne submerged under the olive oil, it will keep well for weeks in the fridge. The olive oil may go quite solid in the fridge but will quickly become liquid again as it comes to a more ambient temperature. The higher quality the olive oil, the more easily it goes solid and takes on a milky colour. However, as soon as it is placed in a warmer spot, it should revert to its normal liquid state and colour. Caraway Seeds in Turkish are called Frenk Kimyon and they are exceedingly difficult to find here. Every spice seller I have ever asked has tried to pass off cumin (kimyon) seeds as the same thing but I can assure you they are not. 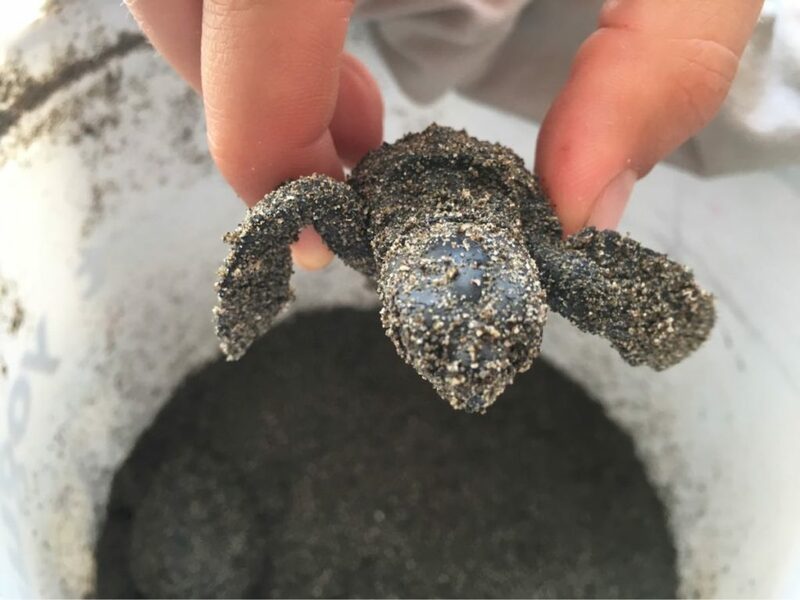 Recently a lovely Austrian friend who was volunteering with the Turtle Foundation on our beach here in Yaniklar, offered to send me some caraway seeds as he knew how we loved to make German sourdough bread. He sent me three different kinds of caraways and said there were many more varieties back home. None of them were close to cumin as we know it here and were all delicious for our loaf making. Leaving out the caraway seeds is fine with this recipe but if you have some and enjoy them as much as we do, pop some in.